I have been really busy the last couple of weeks working on some way overdue projects and organizing. I showed you the recovered dining room chairs in my last post. If you missed this you can see it here. At my favorite local junk shop I found what I believe is part of a foot board for $3.00. The size and shape was perfect for a sign I had in mind. Here is the font I chose and then enlarged.. 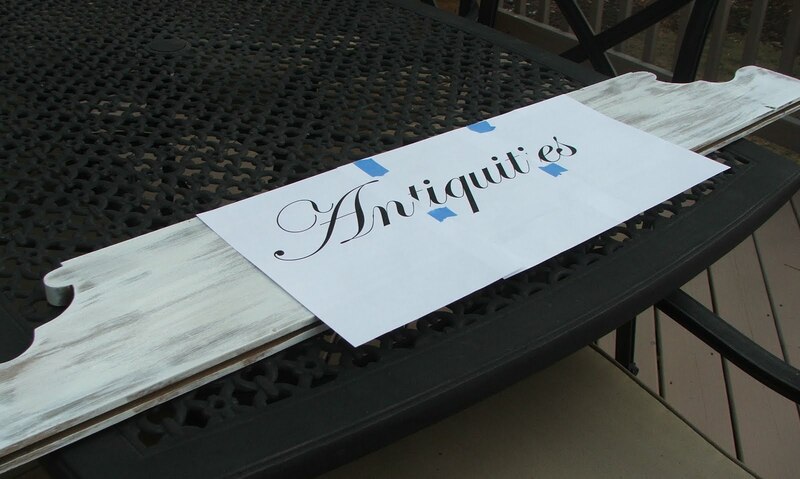 Using carbon paper I traced the letters to the board and then painted with a paint pen. The paint pen is the absolute best thing to use on a project like this. Saves tons of time and it is easy to get clean, crisp lines. Some sanding and Ralph Lauren smoke glaze and the sign was finished. My cost was the $3.00 piece of wood and $2.25 for the paint pen. Everything else was left over from previous projects. I am happy with the results, especially since it is my first attempt at making a sign Notice the address…Carroll is my last name! This is the signs new home! A sneak peek at what else we have been up to…. Sherry, I LOVE the sign you painted. That was the first time. You are a pro already. I don't even know how to do that. I love signs. I also see my favorite jugs on the floor. Wow, you have quite a collection. I just won another one on ebay for 17.00 Yay. I can't wait to get it. The sign is so awesome!! What a great idea….and I think I should invest in a paint pen!!! Thanks! I see you have some of those wine jugs that Kim has been posting about! Love the sign. It really came out great on that board. Looks like it always belonged there! What a wonderful idea and what a great price! Very nice! I love your sign! It's gorgeous!! Not kidding, I am IN LOVE with this! You did a fantastic job and you can't beat under 5 bucks! LOVE IT! What an excellent job you've done! Great score on that footboard by the way. It looks great in your beautiful home. Wow, that sign is AMAZING! I'd never believe it was a first attempt….. You've got my wheels in motion….. Thanks for sharing. That is a great job!! I have tried signs so many times and I have never been happy with the results! I have used paint pens when I have attempted. You said you picked a font and then enlarged it, did you do the enlarging on your own copier or at a copy center? thank you for the inspiration, I may try again. Your sign is fantastic! And, I love that you were able to incorporate your last name. Fantastic! Looks great there with all the blue wares and those baskets! what a great eye you have. you always surprise me! I'm SO inspired! Absolutely love the sign and my mind is now full of ideas of things I might want to try. Thanks so much! LOVE the sign…you talented thing! It looks perfect above your beautiful rack! I love th way you have that dressed! 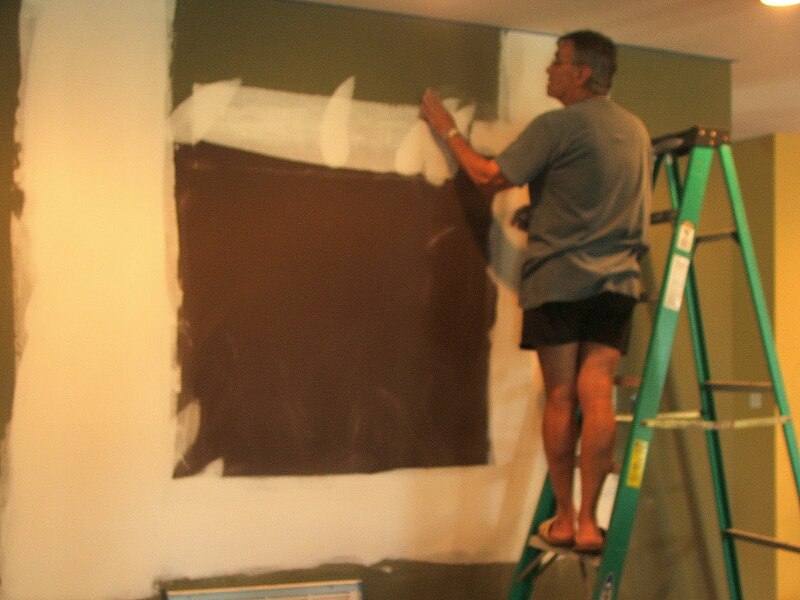 I can't wait to see your finished project…what are you up too;)? Love your sign and the twist on your name, so cute and clever! It very much has a vintage, French look and it looks authentic. Wonderful job! Love your sign. You did a great job. So eye catching! I love your wine bottle collection and your transferware. 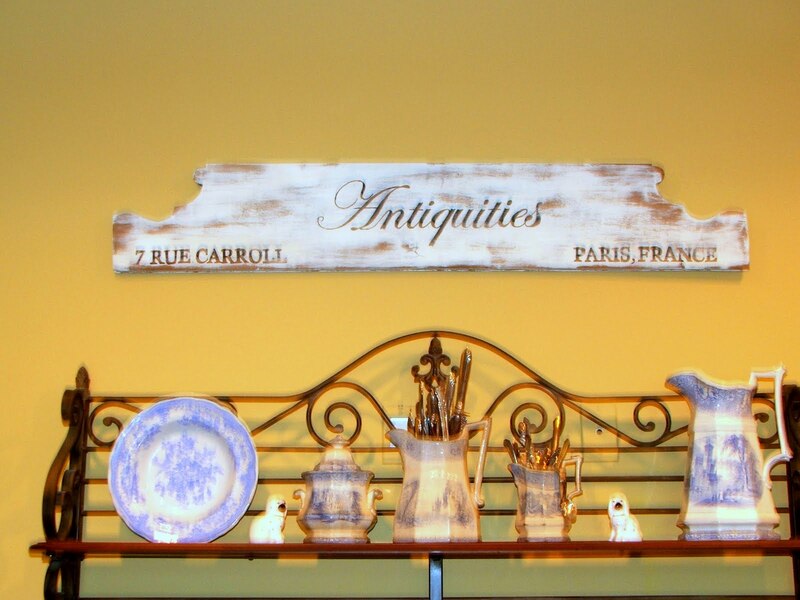 The vignette you have created is full of conversation pieces. Sherry thanks, enlarging the letters and then taping them together was the secret…I got it! I am so impressed with your sign. You have outdone yourself. For someone who has never made a sign before, it's really wonderful. Love where you hung it too. Wow what a great job on that sign!!! I love the scrolly work on the top too!! Great job!! Fabulous.. I am having a CSN Giveway on my blog My Dream Canvas and would love fo you to drop by. Great vision: what a wonderful sign you made! Super….I so love this idea! A lot of work, but boy does it pay off in the end. WOW!! That looks awesome. Where can I score a "paint pen" Im off to Michaels crafts this morning. I hope I find one – thanks for the tip. I just love how your sign turned out. What a lucky find! GORGEOUS!!! What an eye you have seeing the possibilities for this random foot board piece. 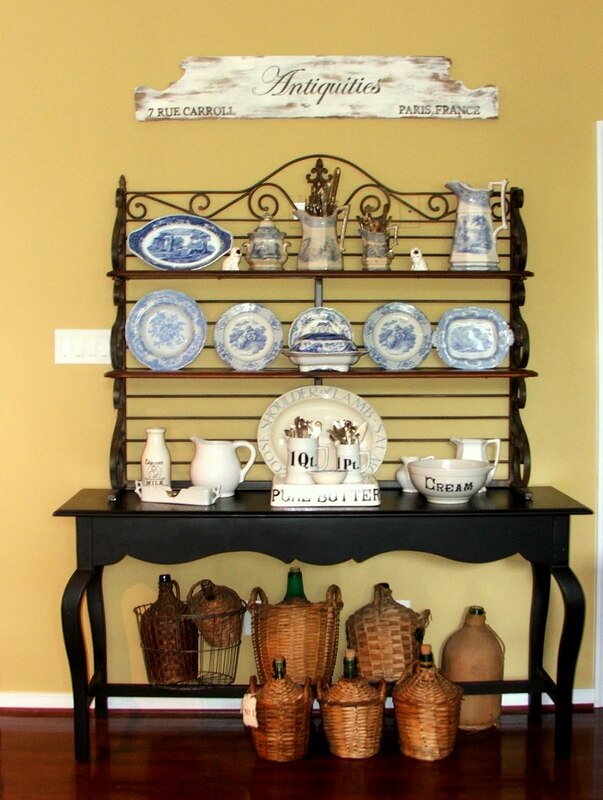 The result is wonderful and I also adore the whole baker's rack vignette it was added to. It looks authentic and like something that should have cost a bundle. Love that sweet sign!! Great job!! I was groovin' on this project by the second pic. but when I saw the finished project I about fell outta my chair…..my last name is CARROLL too!!!! Awesome!!!! Oh my goodness… I love it! great sign and wonderful price. Seriously, the sign is great! I love it! It looks awesome!!!!! you did so good!!! LOVE, LOVE, LOVE the sign Sherry. What a great stroke of genius…seeing the potential in this great piece! I hope you have a wonderful trip to the mountains sweetie. It sounds so awesome to get away for awhile. I thank you, thank you for your dear words of congratulations! It means so much! Wow! You did a great job! Enjoy your trip to VA. I'm off to take a wander through your past posts… have a wonderful week! Hi…..I love that sign! I so need to find a footboard or maybe small headboard. Great idea…thanks for sharing! Sherry, that's a great looking sign! You did a good job on it. Love your find. What a perfect idea for that footboard – great job! I love the sign you made. It had a great shape to begin with and you did a great job on the lettering! Very cute sign. You did a great job for it being your first! What a pretty, pretty sign! I love the baker's rack full of blue/white dishes and the wrapped bottles underneath. Gorgeous vignette. hi sherry, i LOVE your sign! it is so frsh and shabby chic at the same time! i'll have try those paint pens-sounds like it would save time! thanks for visiting cottagromance.blogspot.com and my FOOT BOARD SIGN! thanks for your kind comment and the invite to see your sign! great job! What a darling one of a kind sign! Love that you personalized it with your last name. Wow, Sherry! THat turned out terrific! Great job! loving the sign! I am wanting to maybe make some thing like that for our office. That sign is just awesome! Looks like something from Ballard! Love, love, love this sign. What a great idea for transferring the letters too! It looks perfect displayed over your baker's rack. What a fantastic looking sign! Good eye to spot it and then know exactly what you wanted to re make it into. Great project – isn't it nice to come up with something that works on so many levels for such a modest price? Hi Sherry ~ I need to get one of those paint pens – great job.